Sign up for a coworking membership or reserve your own desk or office. We’re fortunate to stay at near 100% capacity, but everything is month-to-month so new spots open up all the time. Ask us anything using this form, reach out to us on Twitter, or give us a call at 512-LIV-WORK in Austin, or 972-848-WORK in Dallas. Our doors are open! No appointment necessary, stop by for a tour any Tuesday, Wednesday or Thursday at 4:00 pm at our Austin and Dallas locations. We also have an online tour of our Austin campus as well as a 3D rendering of our Dallas campus by Roomored. 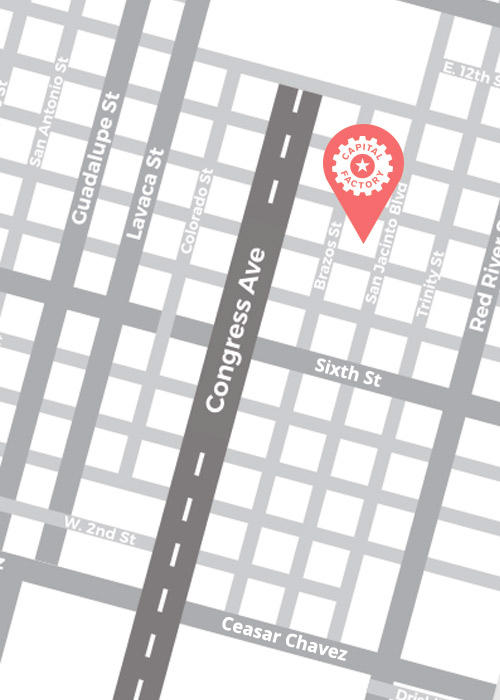 Capital Factory is located in the Austin Centre building at 7th and Brazos in the middle of downtown Austin, Texas. Capital Factory + The DEC is located in The Centrum building on the corner of Oak Lawn Avenue and Cedar Springs Road in Uptown Dallas, Texas.